The fashion industry is so gigantic that it can be overwhelming trying to settle on the career path that suits you best. Between the design, editorial and marketing worlds, there’s lots of overlap and lots to choose from. And, just as all the jobs are different, so is the pay. Put simply: if having more money is important to you, there are certain careers you’ll want to aspire towards over the others. So which fashion careers make the most money of them all? Well, with the help of income data from Glassdoor, we investigated which industry jobs have the highest average salary. Below, you'll find the three careers you’ll want to strive for if you consider big bucks a big priority. 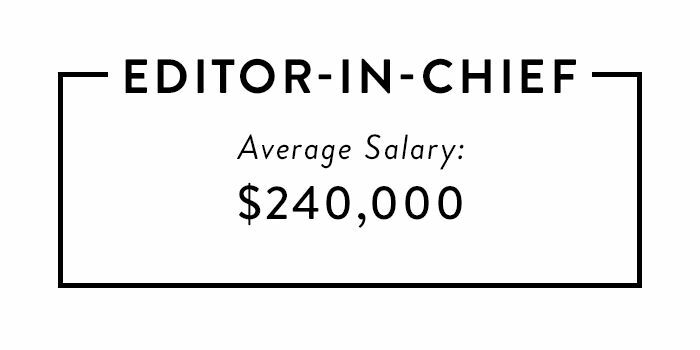 Scroll down to find out which three fashion careers have the highest average salaries. Editors-in-chief (like Anna Wintour, Glenda Bailey and Joanna Coles) are responsible for the day-to-day operations of a magazine, as well as deciding who makes up their editorial boards and managing those people. They are also the first point of contact for the publisher and often oversee the magazine’s budget. It’s no small task, but the upside is that they have the final say on what gets published and the many perks that come with being the face of the publication. These people commonly start out as writers and have bachelor’s degrees in journalism, though—as is always the case in fashion—the path isn’t always so straight and narrow. Chief marketing officers in the fashion space work with brands and department stores to facilitate growth (monetarily and otherwise) by implementing innovative sales and marketing strategies. Their responsibilities can range from overseeing advertising campaigns and rebranding efforts to helping facilitate new store openings. Commonly, these people will have bachelor’s degrees in marketing, management or business administration, and graduate education can be helpful to success in this space. Some well known CMOs include Seth Farbman, who recently left Gap, Inc., and Sheena Sauvaire of TOPSHOP. Design directors (sometimes referred to as creative directors) oversee all apparel and/or accessories design for a brand, but are much more senior than those making the actual clothing. These people are not only responsible for crafting and maintaining a brand’s overall aesthetic vision, but for having a good hold on the market, too. A solid background (and usually formal education) in fashion design is crucial to this job, as the director is usually tasked with explaining the technicalities of each design to the actual production team. Some notable design directors include Marissa Webb for Banana Republic and Humberto Leon and Carol Lim at Kenzo. Are you surprised by these results? Let us know in the comments!